Outlook Express Backup Toolbox (Download) is used to back up information from the Outlook Express mail client and restore it in case it is damaged. 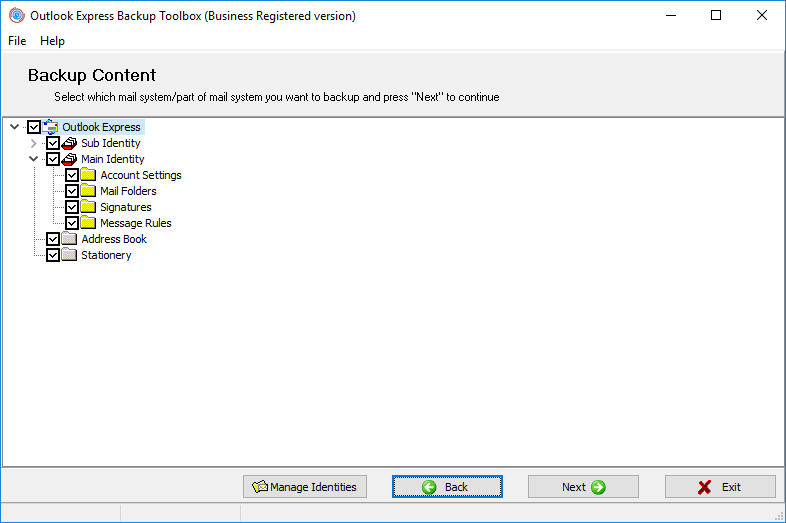 Outlook Express Backup Toolbox can work in two modes. Backup - backing up information from Outlook Express. Restore - restoring information from a previously created backup copy. To start the Backup Wizard, click the Backup button. Click the Restore button to open the Restore Wizard. After you start the Backup Wizard, the program will shows a tree with all Outlook Express information that can be backed up. The top level contains the list of available identities and data common for all users. Information related to specific identities is located on the second level. 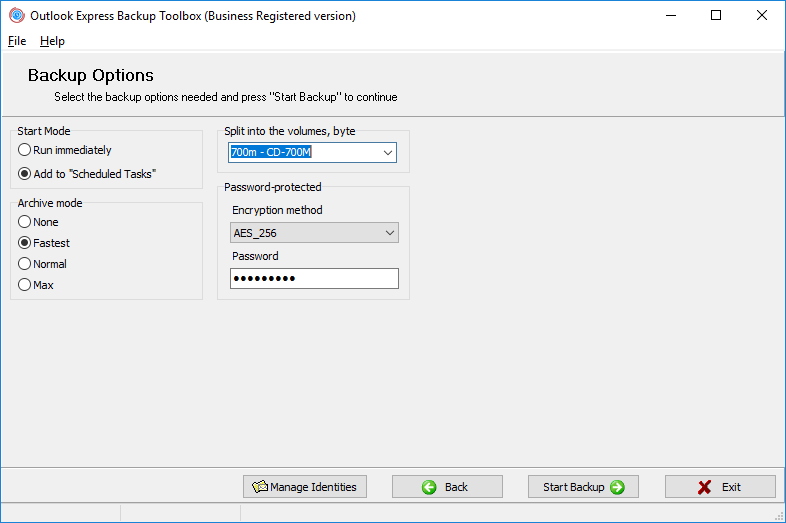 You can use Outlook Express Backup Toolbox to back up the following data. Account Settings - the account settings of a particular identity. Mail Folders - folders with the correspondence of a particular identity. Signatures - signatures from a particular identity. Message Rules - rules for processing mail for a particular identity. Address Book - the Windows Address Book used in Outlook Express. Stationery - common messages templates. Select the checkboxes of the information you want to back up. You can back up either whole identities or only part of their data. Use the File name to specify the name of the file the backup copy will be saved to. 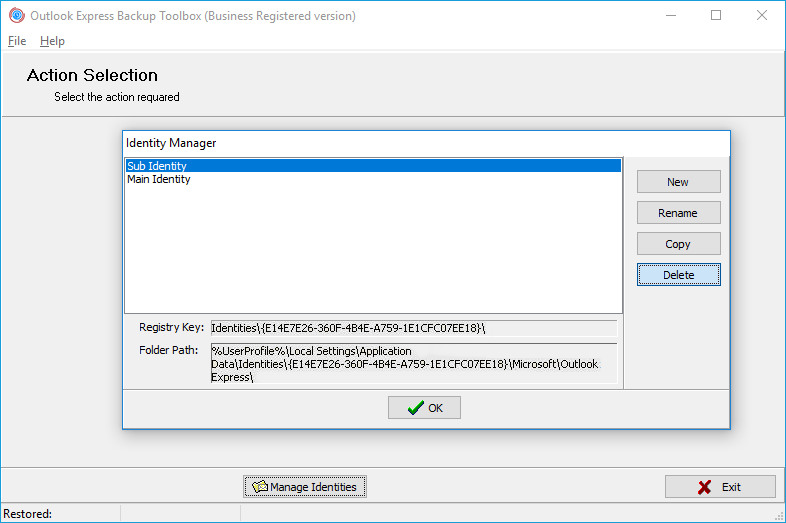 When you move to this step, the program will generate this name automatically according to the following template: Outlook Express Backup [current date].obt. The date in the name makes it easier to find the necessary backup copy when you restore information. There are two ways to change the default name. Type the name manually. In this case, you should specify the full path to the file, otherwise the backup copy will be created in the Outlook Express Backup Toolbox folder. Select the file name in Windows Explorer opened with a click on the button. 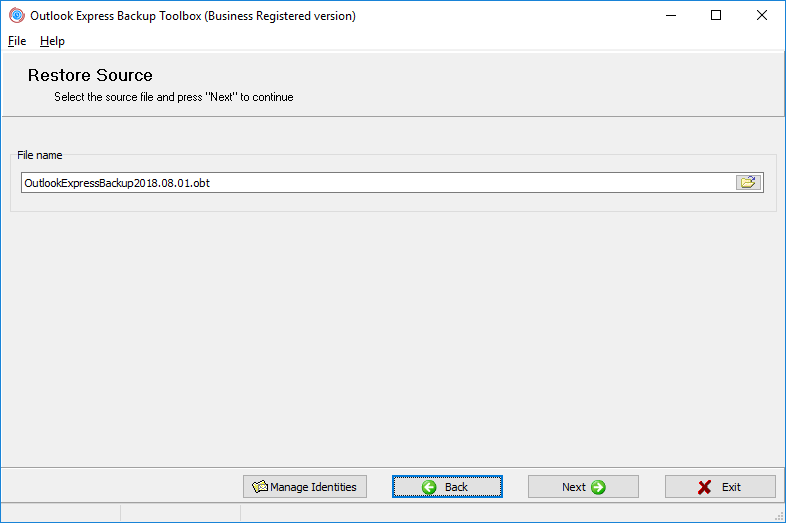 You should configure 4 backup parameters in this step. Select one of the two available modes to start the process in the Start Mode group. 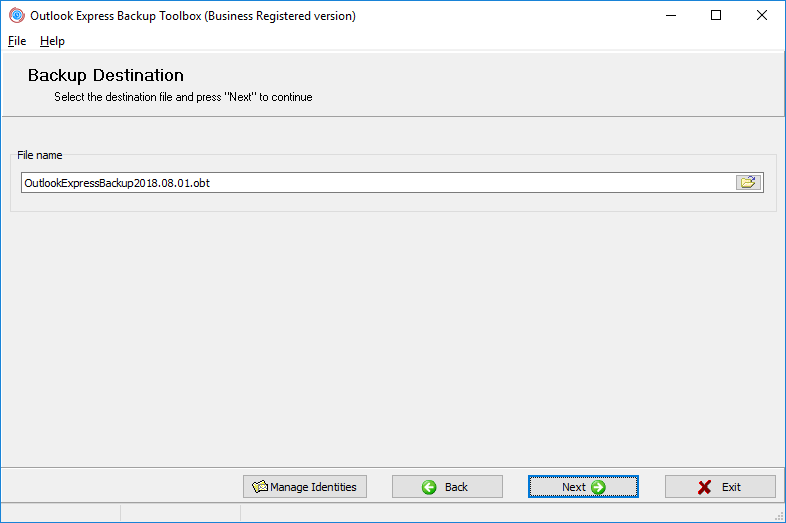 Run immediately - start creating a backup copy after you finish configuring the parameters. Add to Scheduled Tasks - add a new scheduled task in Windows. Specify the compression rate for the backup copy in the Archive Mode group: None, Fast, Normal and Max. The more the compression rate is, the less space the backup copy will occupy, but the longer it will take to create it. If you plan to save the backup copy to removable media (or just split it into several volumes), select the type in the Split to the volumes, byte field: 3.5" floppy disks, ZIP 100 drives, 650 MB CD ROM, 700 MB CD ROM. In case the backup copy exceeds the specified size, it will be split into several volumes so that each volume fits onto the corresponding media. If you want to split the file into volumes of another size, enter it into this field manually (in bytes). If you do not want to split the backup copy into volumes, leave the Split to the volumes, byte field empty. No Encryption - protection is disabled. PkZip Classic - standard PkZip protection. AES_128 - encryption with the AES algorithm with the 128-bit key length. AES_196 - encryption with the AES algorithm with the 196-bit key length. AES_256 - encryption with the AES algorithm with the 256-bit key length. After that use the Password field to enter the password that will be used to access the backup copy. Click the Start Backup button to move to the next step. You have to complete this task only if you select the Add to Scheduled Tasks mode in the previous step. When you move to it, the program creates a scheduled Windows task and opens the dialog box with its properties. If there are several accounts used in the operating system, enter the necessary account name into the Run as field, click the Set password button and specify the password. 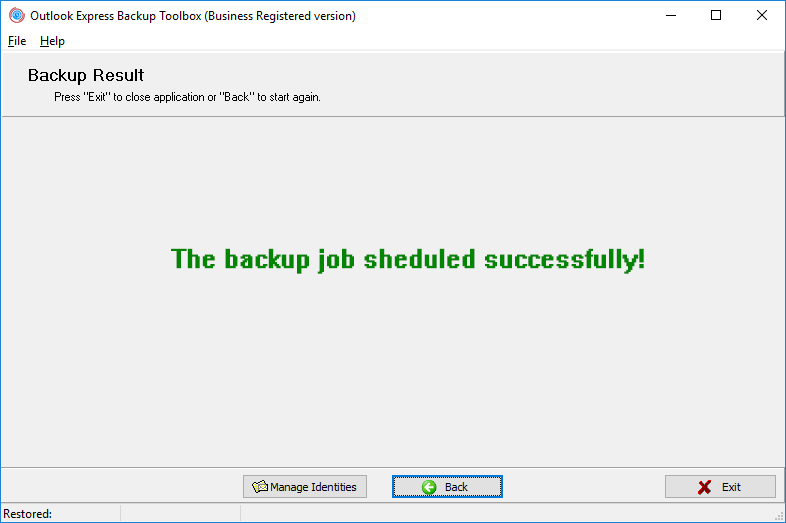 One task can have several schedules, which allows you to implement a flexible information backup policy. After you save the scheduled task, it appears in the corresponding Windows folder (Start|All Programs|Accessories|System Tools|Scheduled Tasks). You can edit it afterwards, for example, change the schedule. To specify the schedule for the task, switch to the Schedule tab and click the New button. Select the schedule type in the Schedule Task: drop-down list: daily, weekly, monthly, once, at system startup, at logon, when idle. Then specify advanced schedule options (start time, days, dates, idle time). These options depend on the selected type. If necessary, you can create several schedules to start this task. To enter a new schedule, click the New button and specify its options. To save the scheduled task and move on to the next step, click the OK button. 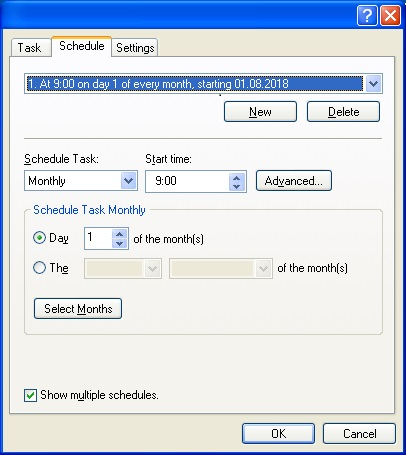 If you select the Add to Scheduled Tasks mode and configure the Windows scheduled task, the program will show you the message that the wizard has successfully finished its work. Note that no backup copy will be created in this case. From now on, the information will be backed up automatically according to the specified schedule. If you select the Run immediately mode, the following question will appear on the screen: Do you wish to start backup process? Make sure that Outlook Express is not running, click the Yes button and wait till the backup process is complete. Its duration depends on the amount of source data and the system resources of the computer. 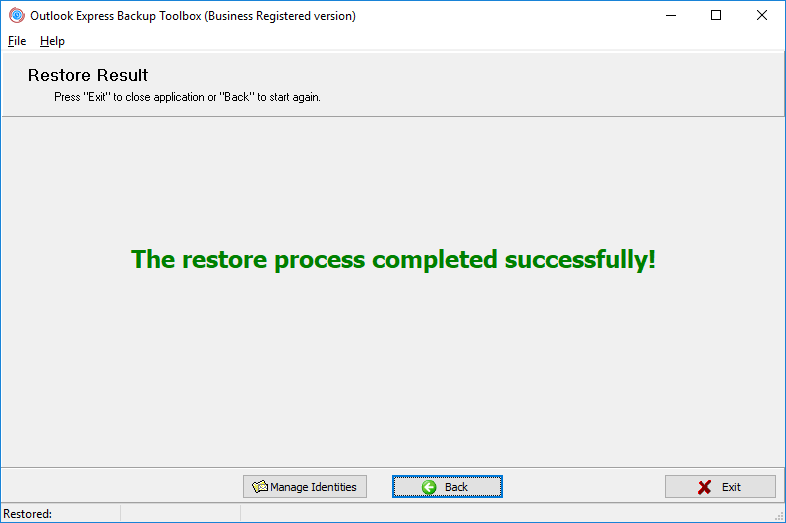 After it is complete, the program should show you the message that the backup copy has been successfully created. There are two modes of restoring information in Outlook Express Backup Toolbox. 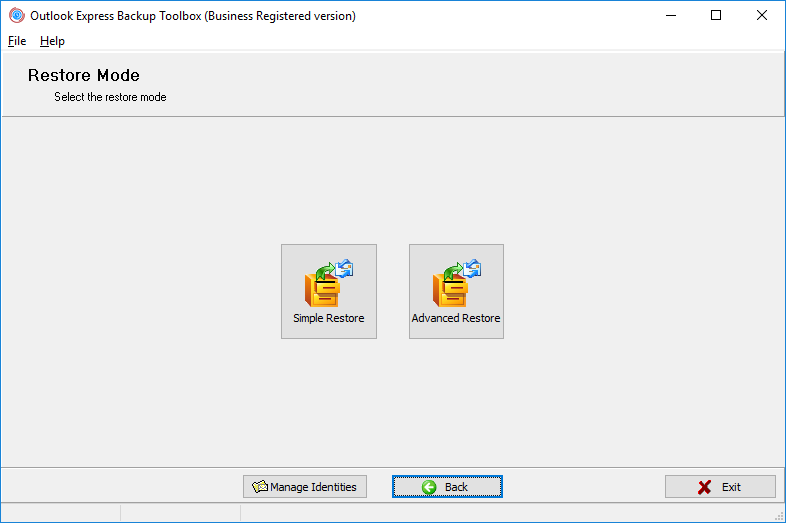 Simple Restore - just restore the entire information from the backup copy. This mode does not require any special knowledge and it is recommended for most users. Advanced Restore - restore information selectively, you can select the information from the backup copy you want to restore and the identities to restore it to. In case you use this mode, you should have an idea about the structure of data in Outlook Express. After you start the Restore Wizard, select the necessary mode by clicking the button with its name. Use the File name field to specify the name of the file with the backup copy previously created with Outlook Express Backup Toolbox. There are two ways to do it. Type the file name in the corresponding field manually. You have to specify the full path in this case. Select the file name using Windows Explorer opened with the button. You will see this step only if you select the Advanced Restore mode. It comes down to selecting the information that will be restored from the backup copy. When you move to this step, the program will show you the tree with all data in the selected backup copy. The top level contains the list of identities and data common for all users. Information related to specific identities is located on the second level. 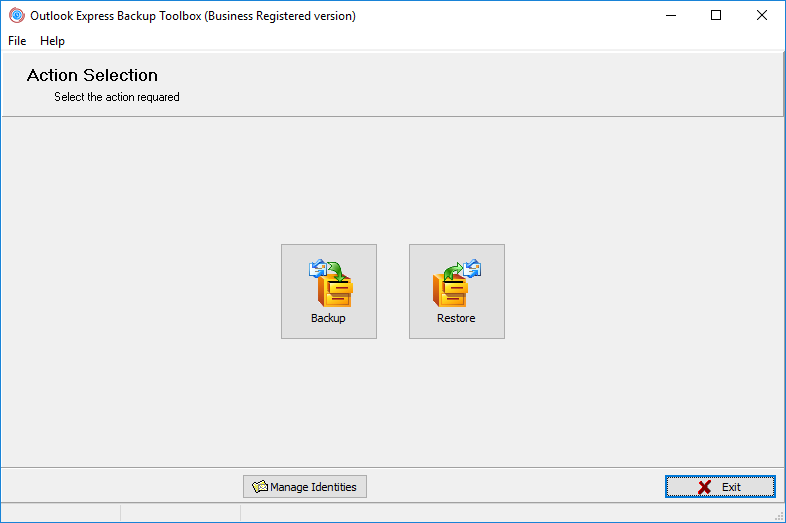 With Outlook Express Backup Toolbox, you can restore the following data (of course, if it was saved to the backup copy earlier). You will see this step only if you select the Advanced Restore mode. In this step, you should select the identities the information will be restored from the backup copy to. 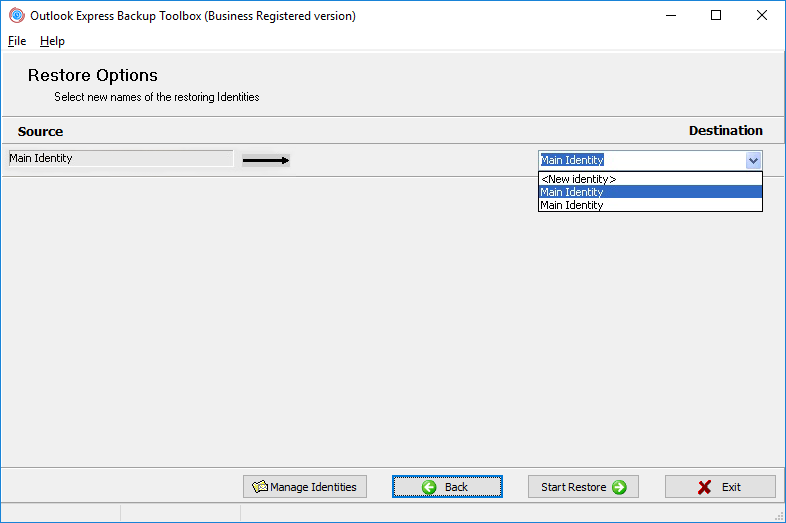 When you move to this step, the program will show you the list of all identities data from which was selected for restoring in the previous step. Select the identities to copy the information to for all restored identities. To do it, you can use the drop-down lists next to them (they contain all identities existing in the system). If you want information from some identity to be copied to a new identity, select the New identity item in the corresponding drop-down list and enter its name. Click the Start Restore button to move to the next step. When you move to this step, the program will show the following message: Do you wish to start restore process? Make sure that Outlook Express is not running, click the Yes button and wait till the restore process is complete. Its duration depends on the amount of source data and the system resources of the computer. After it is complete, the program will show the message that the information has been successfully restored from the backup copy. 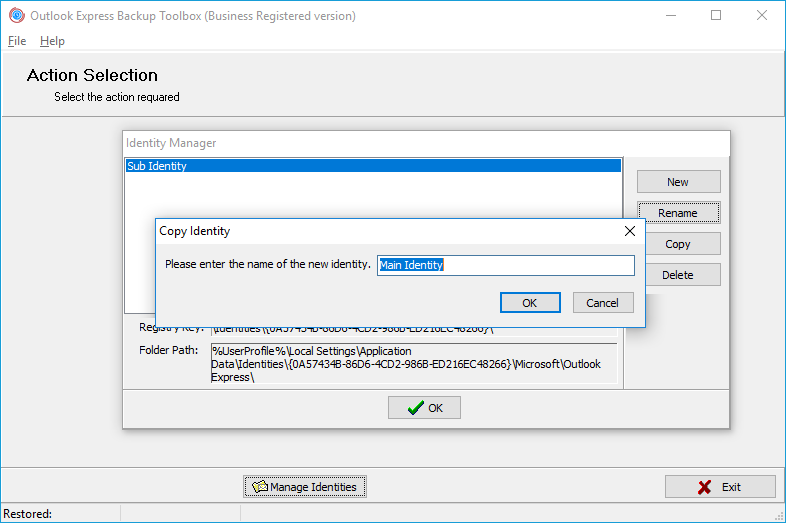 The Identity Manager is an additional tool in Outlook Express Backup Toolbox you can use to perform any operations with identities. It is a separate window with the list of all identities existing in the system. When you select any of them, the folder and the registry key related to it will be shown in the corresponding fields. 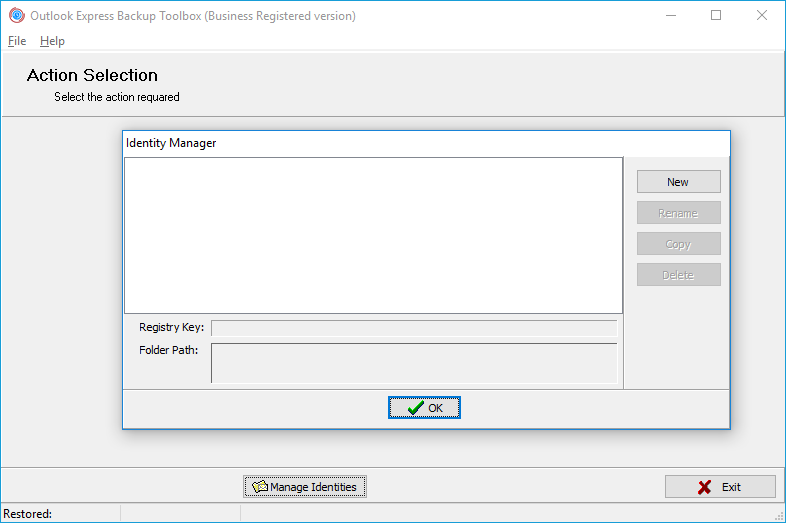 Start Outlook Express Backup Toolbox and click the Manage Identities button. You can open it at any time in any step of any wizard when you work with the program. Click the New button. After that you will see the dialog box where you can specify a name for the new identity. Type it in the corresponding field and click the OK button. Select the identity you want to rename and click the Rename button. After that you will see the dialog box where you can specify a new name for the identity. Type it in the corresponding field and click the OK button. Select the identity you want to copy and click the Copy button. 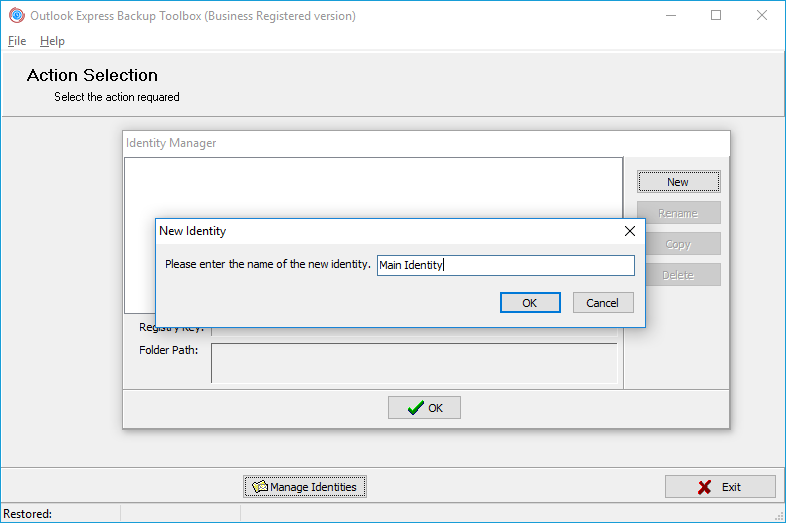 After that you will see the dialog box where you can specify the name of the new identity. Type it in the corresponding field and click the OK button. Select the identity you want to delete and click the Delete button. The identity will be deleted at once.